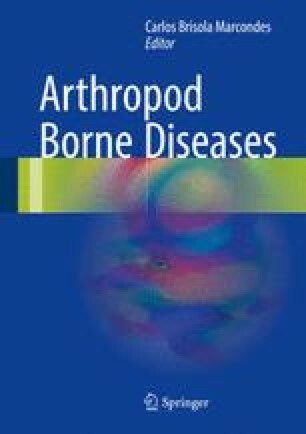 Ehrlichiosis is a term used to describe a group of tick-borne diseases caused by obligate intracellular bacteria of the genus Ehrlichia (Rickettsiales: Anaplasmataceae). A total of six species of Ehrlichia are recognized from humans and other animals: E. canis, E. chaffeensis, E. ewingii, E. mineirensis, E. muris, and E. ruminantium. Additional Ehrlichia spp. have been reported based on molecular and serologic evidence of infection, and new members of the genus are routinely discovered. Disease due to these agents occurs in people, dogs, and ruminants, with occasional reports from cats, horses, nonhuman primates, and other animals. Clinical signs of ehrlichiosis are best described in ruminants (E. ruminantium in Africa and the Caribbean) and dogs (E. canis worldwide and E. ewingii in the United States) and include severe, life-threatening febrile illness characterized by anorexia and lethargy; some agents are also associated with polyarthritis, neurologic disease, or diarrhea. Ehrlichia spp. also infect people; E. chaffeensis-induced human monocytic ehrlichiosis is the most commonly reported tick-borne infection in the southern United States. Ehrlichiosis is diagnosed through a combination of characteristic clinical signs, hematologic abnormalities, and specific serologic or molecular assays to detect evidence of infection. Doxycycline is considered the treatment of choice. Although research is promising, vaccines for many agents of ehrlichiosis are not widely available and prevention of disease focuses on tick control.